Resistance, no matter how light-hearted or forceful it might seem to be, will always transform into some sort of suffering. To resist is to deny, and to deny is to go against that which already IS. We should never attempt to pit ourselves against reality itself, it’s not a struggle that can ever be won. Therefore, to be free from suffering we must have total acceptance of whatever we encounter. This isn’t to say we shouldn’t defend our personal liberties (or those of others) whenever they are threatened, but that we need to fully accept the truth of a threat, whatever it may be, and act accordingly, however the situation best deserves, without any hesitation whatsoever. To resist is to waver. It is to be choosy and unsure. Hesitation is the seed of discontent from which anxiety, doubt, restlessness, anger and fear grows, which can then breed harsh deeds done in the heat of indecision. Act, decisively—but not blindly out of rushed ignorance or ill-considered naiveté. You’ll know what to do when the time comes—but don’t falter or second-guess yourself. Second-guessing only impedes you, causing you to miss the most opportune moment in which you should act. Hesitation makes the archer miss his mark. A person uncertain of their skill will make many mistakes. When we resist our natural instinct, we struggle and falter, and we suffer because of it. A touch of doubt can certainly be a healthy sense of caution, a hesitant hand can also be too slow to respond when urgency is required. Act decisively, with the intuitive wisdom, courage, and confidence that flows through your infinite awareness. Your awareness has no bounds—it’s only limit is the extent of your thought. 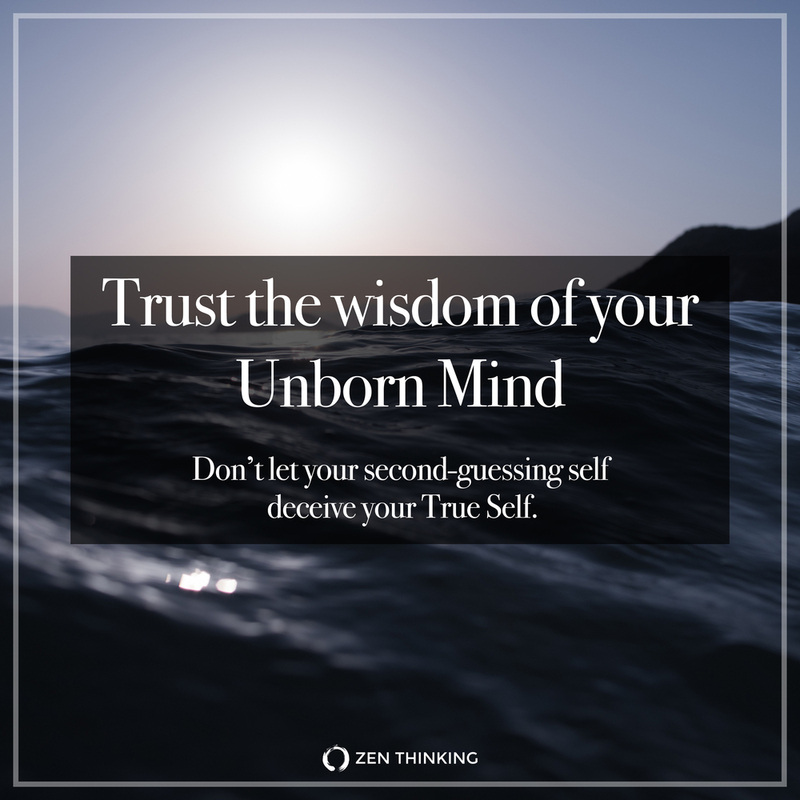 We need to re-learn to better trust our True Self—that Unborn presence within us, that is the very essence of our being, that pulses through us and that animates our spirit and mind. I say it's Unborn because it’s an intelligence that exists without ever being present in our consciousness—it intuitively knows what to do, before we've even had a chance to think. It is this Unborn wisdom that is able to see the truth of reality clearly, unclouded by any hesitant thought, worry, or false belief. Resistance only causes you to needlessly ponder and dwell, hindering your ability to act confidently and effectively, causing grief through ambivalence. We need to tune in to the frequency of our unspoken intelligence that vibrates through the very nature of our being. Abide in the Truth Realization of the Unborn Self. This is what it means to be in accord with the Tao, going with the flow of life, rather than resisting it through tense, overwrought, anxious and hesitant thought. Don’t let your second-guessing self deceive your True Self. Trust the wisdom of your Unborn Mind.